In multiple areas of cybersecurity, time works in favor of the attackers-making time the strategic advantage that defenders need to regain. 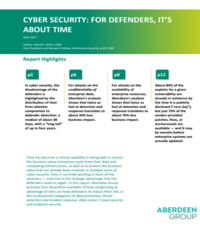 In this report, Aberdeen Group provides four illustrative examples of how recapturing the advantage of time helps you reduce risk in the fundamental categories of data protection, threat detection and incident response, data center and cloud security, and endpoint security. Download this report to learn more.